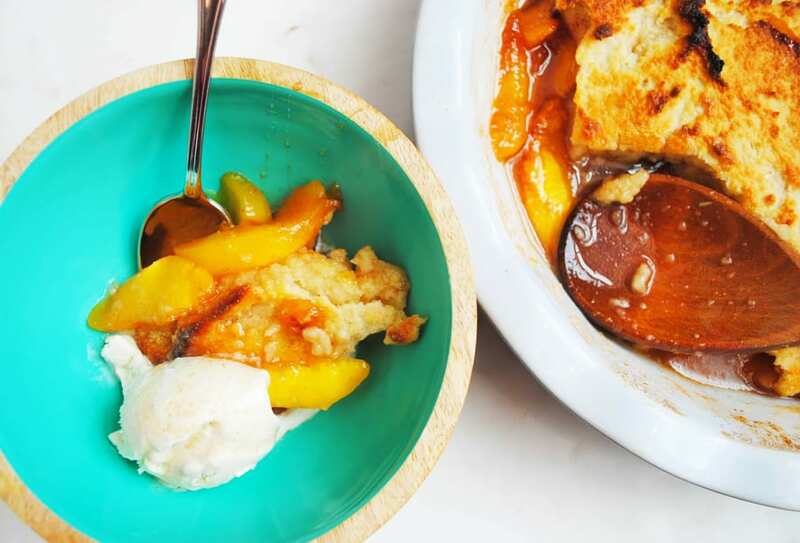 Bourbon Peach Cobbler really seems to sum up how I feel at the end of summer and into the start of fall. I miss the fresh peaches already and the deep caramel color of bourbon seems to invite the fall season with open arms. It doesn’t hurt that the bourbon only enhances the flavor of peaches. Fruit cobblers tend to fall into two categories: biscuity thick crust, or more of a thin batter poured over the fruit. I tend to like the biscuity thick crust with most berry cobblers. The substantial crust pairs well with the delicate berries. With stone fruit like peaches, however, I much prefer a more thin batter. The batter seeps in between the fruit and bakes up nice and puffy like a delicate cake. It lends itself to the slices of fruit which tend to hold their shape in the bake. And in all honesty, it’s how my Mom always made peach cobbler. The thin syrupy batter gets nice crisp edges when baked in the oven with the juicy fruit. Top it with a scoop of vanilla ice cream and man oh man are you in heaven. For the topping on this Bourbon Peach Cobbler I used some almond flour because of it’s delicate texture and flavor. The mild nuttiness of the flour really lends itself to the taste of the peaches and the bourbon. The bourbon is not totally necessary, you can leave it out if you don’t keep bourbon around the house, but I love the subtle caramel flavor it leaves in the peaches. The alcohol cooks out and just the delicious flavor is left behind. Cut the butter into the dry ingredients until it looks like course sand. Top the fruit with the batter. And bake. Serve with dollops of vanilla ice cream. Combine the peaches, sugar, cinnamon, and bourbon in a medium bowl. Pour the peach mixture into a 9" deep dish pie plate, or a 8" square pyrex baking dish. In a separate bowl combine the flour, almond flour, salt, and brown sugar. Cut in the cold butter to the flour mixture with your fingers until the mixture resembles course sand. Then pour in the buttermilk and mix well. Spread the batter over the top of the peaches in the pie dish. Brush the melted butter over the top of the batter. Bake at 425 degrees for 35-40 minutes, or until the top gets nice and brown.